I bought the early Sutherland and am listening. Better conducted than I thought b y Sanzogno. Mc Neil fine with great voice. Cioni a little shrill but characterises well. Sutherland - what a voice she had! But for the character seek elsewhere. But I can enjoy for sheer splendour of sound. I'm with her all the way and have been heard saying much the same thing! Last edited by Annied; Sep-13-2017 at 20:16. Just been listening to the Callas / Gobbi / Di Stefano Rigoletto and the quartet. This is absolutely amazing as is the whole performance under Serafin. Great characterisation. Di Stefano the best Duke on record and both Callasd and Gobbi incomparable here. Pity about the wretched cuts but this performance is the standard by which all others should be judged. Last edited by DavidA; Oct-02-2017 at 06:14. 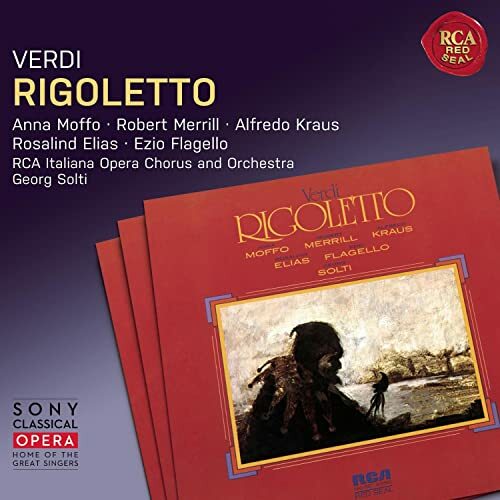 This was a quite tiring Rigoletto challenge, with 14 recordings that showcased their strengths and many flaws too. Of the honourable top 7, I didn’t find a weak Sparafucile or Magdalena, but the competition was always in the performance of the main trio and the orchestra too. The second and worse half of the recordings featured two Sutherland Gildas that never please me (the Sanzogno for Decca is dull no more no less and in Bonynge she is more or less decent); a “Germanic” Eurodisc recording by Lamberto Gardelli that was a waste of time for me (odd diction by the singers) and a plain EMI recording conducted by FMP that never lifts up. The two controversial points of this challenge were the Kubelík and Bonynge recordings, which in the first challenge (Opera Feast) got lukewarm reviews and receive no less. Both are spectacular failures for casting (Kubelík) and recording quality (Bonynge). In the Kubelík Scala recording, Scotto would show a much better Gilda in a previous Gavanezzi recording (she sounds strenuous), but the orchestral sound and Fischer-Dieskau sink the recording. The positive side is the progression and improvement of Bergonzi in Acts II and III and the powerful quartet by Gilda, Magdalena, Sparafucile and the Duke. I can only think of the Bonynge London Symphony recording to listen to the incredible Duke by Luciano Pavarotti, for me the best-achieved in discography. My let-down was Sherrill Milnes, whose Rigoletto doesn’t show enough vocal characterization. He doesn’t provide weight in the dramatic parts, but he would do much better in the later Rudel Philharmonia recording. Sutherland being Sutherland. Forever a great Lucia. Recording-wise, there were so many effects and elements in the mix and the microphones were so close to the singers that many parts show distortion and the effects sound dated. I don’t buy into it. In a more positive note before the second and best half, I should say we would pay a fortune for a live performance like the one in the Trieste 61 recording, conducted by Francesco Molinari-Pradelli (MYTO has wrongly labeled it as “Alberto Erede” in the back cover, I double-checked). It’s the second Duke by Alfredo Kraus, very convincing and the star of the performance. Gianna d'Angelo and Aldo Protti are quite fine. The applause in the middle make me lower the mark and the sound is really good. In the first half, we usually have a battle of elements: orchestra, conducting, chorus, and the characters of Rigoletto, Gilda and the Duke. It’s often a game of pull&push. I found many convincing Stereo recordings, and especially interested in some underdogs like the Sinopoli, Gavanezzi and Rudel recordings, each with their strengths. 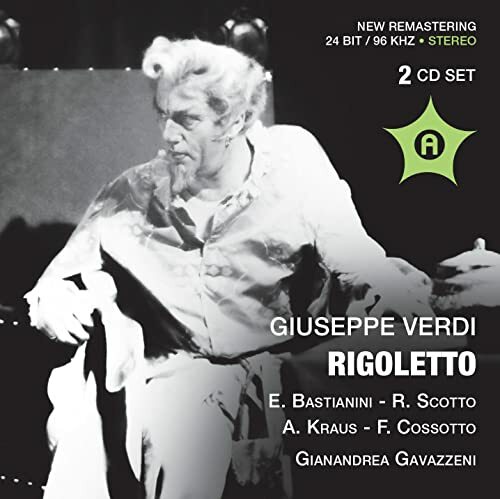 Both the Sinopoli and Solti recordings, provided their recording and performing quality, could have achieved the top spot for a stereo Rigoletto, but the cast was sometimes a let-down. I find the strongest orchestral and choral performances in Giulini, Solti, Rudel, and then Sinopoli and Perlea. My favourite Rigoletto is here Tito Gobbi, and if not, I go for Sherrill Milnes in 1978 or Ettore Bastianini in 1960. Robert Merrill is finer in the Perlea 1956. My favourite Gilda is Maria Callas over the universe, followed by Ileana Cotrubas and Renata Scotto (1960). My favourite Duke, if it cannot be sung by Luciano Pavarotti, can be Plácido Domingo or a competition between Alfredo Krauss in the 60s and Jussi Björling. Neil Shicoff is an Honourable Mention. Sony has remastered a really good recording that shines in the conducting and orchestral point of view. The brass is powerful and dramatic. There are sound effects in the first scene, not annoying at first, but they continue through the other acts, and they distract me. The cast is fine, with the spotlight on Alfredo Kraus. I’ve heard a better Robert Merrill in the Perlea recording, and here he has aged. Kraus signs his most pleasing Duke, although in the MP and Gavanezzi he is not very far. He is the weak link. I noticed that David Ward's Monterone pronounces “Monteron”. Although it is a competitive recording, I’m not for a prime Anna Moffo. It’s not my kind of voice and I even like more an aged Beverly Sills. This was my earlier stereo favourite for the orchestral an vocal performance, although I never thought it could be a summit for the work. At first I was very optimistic with the SQ, the brass and Sinopoli’s conducting in the overture. It didn’t have any particular sound effects and the chorus is really solid (their volume is sometimes oddly loud). What I missed was that Sinopoli kept the tension in the score throughout Acts II and III. Everything could be considered as really good, competing with Julius Rudel. Then, in the cast it went sideways. I didn’t remember such an unexpressive Rigoleto in Renato Bruson. He became the weak link. The best part was the surprising performance by Neil Shicoff and Edita Gruberova in the Duke and Gilda characters. Shicoff has at first some issues with the stresses. Very clean recording and a recommended listen. I wish Sony had remastered this, because both the conducting and the orchestra sound solid and clean. The pace is slow and the overture sounded epic (ok, it was the first in the challenge), while the whole score is able to portray the drama in the complete recording. 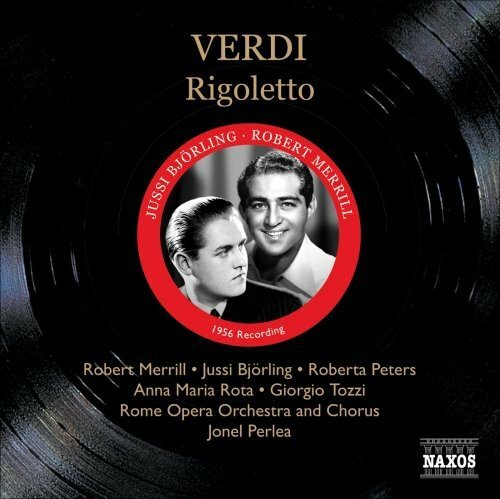 A pitiful Merrill Rigoletto and a compelling Björling Duke make the recording rise. It was my first Jussi Björling experience, and looked like Plácido Domingo was chewing gum. Roberta Peters can defend herself in Gilda. This is a studio recording in stereo but released by Andromeda. The orchestra sometimes sounds thin and with low volume, but the detail is decent. The casting is stellar, not bound to recording labels. 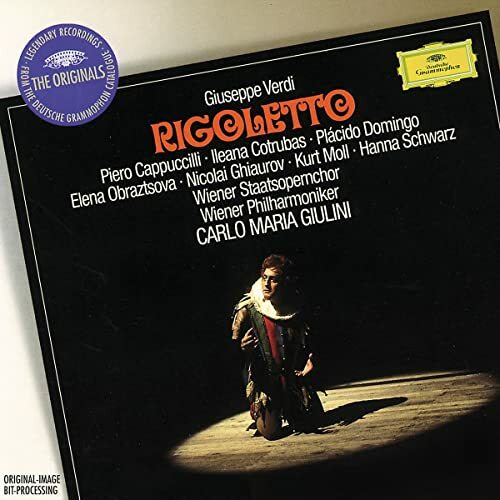 Renata Scotto is the star in this recording, signing an astonishing “Caro Nome”. Bastianini's voice is so polished that almost makes up for a Giorgio Germont instead of Rigoletto. It's very noble. Alfredo Krauss is equally compelling in this recording although he could shine more, especially in Act III. The final quartet before Gilda’s murder, with Cossotto, Scotto, Krauss and Vinco is great. I swear this should not have been a HM, but the level of the rest couldn’t compete with this (besides, this was streamed after the Serafin recording). There is no need to remaster this 78 recording in my opinion. It’s really bold in the orchestra from beginning to the end. The conducting is good to great, and the cast is not as aged as some say. 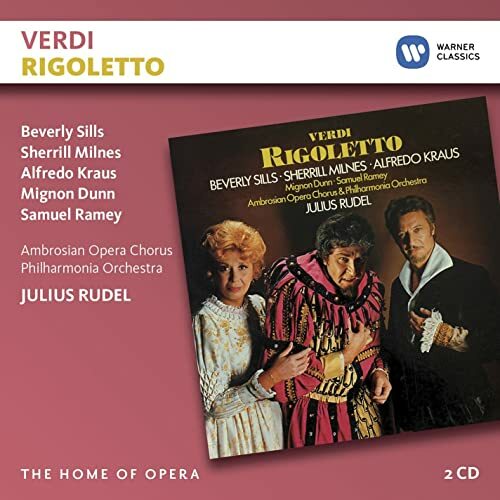 Sherrill Milnes is the star of this recording and the model Rigoletto if we don’t count Gobbi. He sings with a successful combination of vocal quality and characterization. He sometimes reminds me of Gustav Neidlinger. Samuel Ramey’s Monterone is also quite well-performed, but mind that he also sings Sparafucile. Alfredo Kraus’ final Duke is not spectacular, but he is really good for the role anyway. He enlarges the second to last syllables and works out the toughest duets with Beverly Sills. Her late Gilda shows more ageing and weaknesses although she can remain convincing for the most part (a reliable “Caro Nome”). She loses presence in her duets with Milnes. In the end the orchestra becomes the star with sharp but clean playing, ending the opera with a thundering timpani. The stereo winner of this challenge had a very bad luck last year being played after the Sinopoli recording. I didn’t feel any impact and only listened to Act I. That time I wasn’t paying attention to many of the features I’m addressing here. Although the 24bit remastered version offers more detail in the external band in Scene 1, the 1999 remaster is very accessible and decent for the level of the performance. The Wiener Philharmoniker (incredible) grows more confident throughout the opera and is flexible enough to address the requirements of each scene. Their flavour is very positive for many parts of Act II, like Rigoletto’s song. In fact, I’m not very impressed by Piero Cappuccilli’s performance as Rigoletto, which he fulfils dutifully but without brilliance. The main point here is that the orchestra helps him to lift up his solo parts. He can be considered the weak spot. The duets are really well-performed generally. Plácido Domingo sings the Duke almost like a competition with Luciano Pavarotti, showing off his abilities. He has more success in Acts II and III and his Dona aria has nothing to envy about the Italian’s. Cotrubas also seems to be competing against Maria Callas and carries the Gilda role to a comfortable place where she adds an exaggerated lightness and delicacy that works 80% of the time. Sometimes I don’t know if I prefer her or Scotto. It’s the recording. The sound of the recording is very metallic. It’s detailed for me and well-conducted. Both Callas and Gobbi are the stars of the recording and discography. Unbeatable. The only weak spot is Giuseppe di Stefano, with a certain attitude that seems dry to me. He does a very good performance. Di Stefano a weak link in the Serafin recording? Sorry must disagree very strongly. To me he is everything a Duke should be. This is the best performance on disc. The problem is the cuts and the aged recording. Edit: Probably you've already seen my previous answer. I have to remember more often to ignore replies that attack a particular remark (often about a singer). I invite readers to take into account the general painting and not how well did X or Y for me in a competitive listen. And then try for themselves. I'm doing this out of love, but I can perfectly do like other senior members: do my reviews privately, buy the recordings I love, post in Current Listening and go chit-chat to the Community Forum. All my respect. If I told you how much I have changed my opinion about Jochum's Bruckner in Dresden in a year... Now I take everything more relatively and try to bring it for my "reviews" and "guides". If you want a serious musically informed review, subscribe to Gramophone and pay. Last edited by Granate; Apr-02-2018 at 20:52. Just obtain date Muti recording from La Scala (bargain basement). It is quite good, surprisingly in spite of the reviews. Worth hearing fro Zancanaro's superb Rigoletto. He has the right voice and everything. Dessi a fair Gilda but La Scola a weak Duke although he sings pleasantly. Muti conducts a 'critical edition' and appears rather too careful for much of the time. What happened to the guy who conducted Macbeth? This is my choice. Why? Excellent singing and conducting, never too fast. The score is COMPLETE, no cuts that I can discern. The acoustics of the recording are slightly reverberant, but the stereo sound is excellent. Rigoletto is the only Verdi opera I really enjoy and I've heard a bunch. The Serafin/Callas is the classic, but for good sound and hearing ALL the music this does it for me. Last edited by Itullian; Nov-30-2018 at 23:58. I've recently listened to Dima's last recording, and it's beautiful. I was especially blown away by Nadine Sierra. She really sounds like an angel. Sorry, but there is a very noticeable cut in the first Sutherland Rigoletto: the cadenza to 'Parmi veder le lagrime'--which is in the score, so presumably Verdi wanted it. Cioni doesn't sing it, and neither does Pavarotti in the other Sutherland recording. Late to the party, of course. 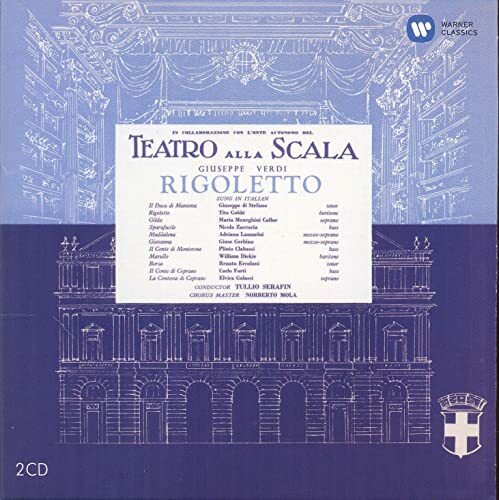 Am I the only one who finds Scotto's voice in the Kubleik Rigoletto so thin, shrill and metallic as to be physically painful--whether it's the recording, mastering, or just her voice? I have to say that I find her '60s voice likewise unlistenably painful in the touted, but to me, very unsatisfying, Barbirolli Butterfly, and brutally cut Votto Traviata as well. Her earlier more cut Rigoletto (though a few are opened) with Kraus and Bastianini does not have this problem, interestingly. Interesting--I thought she was even more shrill in the Gavazzini/Kraus/Bastianini than in the Kubelik. I think I tend to like her best in several 70s recordings--there's less of a hard edge in her voice in Adriana Lecouvreur, but then again, there are also fewer challenging high notes for her in the role. Interesting--I thought she was even more shrill in the Gavazzeni/Kraus/Bastianini than in the Kubelik. I think I tend to like her best in several 70s recordings--there's less of a hard edge in her voice in Adriana Lecouvreur, but then again, there are also fewer challenging high notes for her in the role. I guess it really depends on the mastering. The Ricordi I have is very laid-back--and even a little boomy; no shrillness at all. 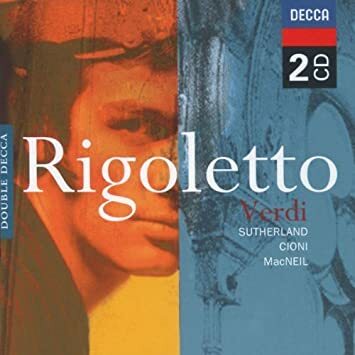 The DG Kubelik Rigoletto makes Scotto ear-splitting like the DG Votto Traviata, really unpleasant. I'd have said it's DG, and maybe it is their digital transfers, but her EMI Butterfly is also wiry, thin, and sets my teeth on edge; everyone likes it but me (actually, I don't like anyone or anything about it). You are absolutely right that the mid 1970s Scotto is best. But there's not much recorded during this period: two really good recitals--Verdi, verisimo, Trittico, and...Adriana Lecouvreur which is not my style, though I have it. But on the rare occasion I want to hear that opera, I go back to Tebaldi (though Callas recorded the two interesting arias in 1954, which is kinda all I need). Last edited by RES; Mar-15-2019 at 23:49.